This was a unique and captivating sanctuary resort and experience. The major domos were so professional, friendly, and really offered exceptional customer service. We felt like “Royalty.” We will definitely be back soon! And we will request this suite JE1 again! We are looking forward to seining you all again! All the staff here provided excellent service. Divers, housekeeping, major domos etc. All smiles and wonderful people. It really added to our experience here at Jade Mountain. Best honeymoon trip ever. Loved the roof top experience incredible view and beautiful room. So private. We were blown away by the beauty and facilities. A complete de-stress; well done. The room was breathtaking, beautiful view and truly felt like you were a part of nature. Loved Jade Mountain, will definitely come back. Thank you all for everything. Best resort ever!! We have vacationed in many places and this is by far our favourite room and resort ever!!! We will ABSOLUTELY be back. We vacationed with you for a week and split our time between Anse Chastanet and Jade Mountain. Overall, we loved both resorts. This has been the absolute best week. Jade Mountain made the perfect honeymoon! The major domos were excellent. The food and drinks were Divine! I am so glad we chose to come to Jade Mountain! Everything about this place is unbelievable. Everyone greets you so nicely and it was wonderful! We hope to be back soon! Outstanding in every way! Jade Mountain never disappoints, great service, great food, and great people/staff. Thank you! This is the most incredible resort we have ever been to. Hopefully we can come back someday and recommend some of our friends to spend their honeymoon here as well. We had a wonderful stay. Completely lived up to our expectations and more. Our experience was wonderful, we will definitely spread the word of our visit to all friends and family and on all our social media. The employees all made us feel like family. Pictures do not do this breathtaking and amazing place justice. If only all we tell can experience it!! Not only is your resort amazing, but your entire staff is more than that! They treat you like family. I leave Jade today sad, but with many new finger prints on my heart of each and every one we met while visiting Jade. We loved it and love you! Definitely Till next time. See you soon!! There are no words to describe how incredibly amazing Jade Mountain is. The hotel’s architecture, the stunning rooms, the infinity pool concept, the location etc., we felt we had stepped into a film set. The view of the Pitons which you see everywhere is mesmerizing. The staff are all fantastic, nothing is too much trouble, particularly our major domos. The food is also beautiful. We enjoyed everything and appreciated the entire staff. Thanks again. We love Jade Mountain and everyone in St. Lucia. We have told many of our friends of the special people of the island. And the Jade Mountain service is second to none! There is not one complaint about anyone because everyone is fantastic. We cannot express enough how wonderful everyone is. Everyone we pass has a “good morning”, “enjoy your dinner”, “have fun at the beach!” and always with smiles. Our friends and family are tired of hearing how amazing Jade Mountain is. But we won’t stop talking about it. We can’t wait to be back in 2 years. Perfect. This is the closest to paradise we will ever get. Thank you to all for the most memorable honeymoon and overall vacation of all time. Thank you for all of the special treatment regarding our 10 year return trip for our anniversary! This was a wonderful way to celebrate. We hopefully won’t wait another ten years to return. We had a superb vacation. Exceeded all expectations! We couldn’t believe how kind and sincere all of the staff were. It went beyond just “hello/goodbye”. We felt the staff were engaged in conversation and remembered us daily. We had an excellent stay and would highly recommend St. Lucia and particularly Jade Mountain. The service was exceptional and we felt welcomed and pampered from the moment we arrived. The sanctuary was absolutely gorgeous. We had a phenomenal trip and made memories for a lifetime. All the staff were so kind and genuinely warm and courteous. We wish we could do this honeymoon vacation every year. We’d love to come back next time for an anniversary. Everyone at Jade Mountain is so memorable. We felt welcomed everyday. Seeing helpful, kind, patient, beautiful, happy people made St. Lucia that much more amazing! I will always remember you all and this trip. Wonderful property, well managed staff, very professional and friendly. We had an amazing time at Jade Mountain! The service was great and we were able to get help at all hours of the day. The food and accommodations were also great. We will definitely be coming back and will recommend to friends and family. Thank you so much! This was truly the honeymoon of our dreams! Everything was perfect, and everyone was so friendly and kind! We will be recommending Jade Mountain to everyone we know and will definitely come back ourselves! Our domos were so great, and took care of everything for us! Everything about our stay has been an incredible experience. All of our major domos went above and beyond to fulfill our wishes and make sure we had a wonderful and relaxing stay. The best place we ever stayed! Jade Mountain proved to be as breathtakingly beautiful, serene and surreal as it appears in the photos on the website. My husband and I stayed there for three nights in late December to celebrate our anniversary. We stayed in a sun sanctuary, JE3. It was beyond amazing from the gorgeous view to the private infinity pool and the comfortable bed, all gazing out over the ocean to the pitons. It was tranquil with birds chirping, breezes blowing and water trickling. We hardly wanted to leave our sanctuary at all. But we managed to enjoy yoga on the rooftop terrace in the mornings and take a walk down to the beautiful Caribbean blue ocean for a swim. We didn’t do other things that were available, including a sunset cocktail cruise, hiking the pitons or hiking to the waterfall, visiting the chocolate lab or visiting the plantation. I am sure we would have indulged in some of these activities if we had been there longer. We had breakfast delivered to our sanctuary every morning where we ate in peace and quiet. Clothing was unnecessary while we were enjoying the serenity of our sanctuary, even though there are only three walls and the fourth is the wide open beautiful view! It was very private and peaceful. We enjoyed dinner at both the Jade Mountain club and the restaurant down on the beach. Be sure to make reservations if you have a specific time you would like to eat. The food was good and the service was impeccable. When we arrived on our first evening, which was our anniversary, we returned from dinner to find our sanctuary lit with candles and our bed decorated with rose petals and a chilled bottle of champagne. Our Jacuzzi bathtub was filled with hot bubbly water surrounded by candles and rose petals. The personal concierge service included with the sanctuary was perfect and attentive to all details. The staff was wonderful and took very good care of our every request. We would definitely return and request the same room! What a wonderful piece of heaven on earth! We had the most wonderful honeymoon that we will never forget. Everyone we met was kind, courteous and had smiles on their faces. Hands down the best serviced hotel! We can’t say how much we enjoyed our stay. There are so many that touched us and touched our hearts. You have truly created a heaven on earth. We can’t wait to return. We visited the property twice, prompting us to want to stay. We will be back! Excellent guest experience well done! Far personally attentive and mindful than any chain (4 seasons, Ritz) blending, relaxed, peaceful enjoyment with excellent cuisine. All staff were friendly and positive. It’s our second time here in less than a year and, as with our first visit, we are blown away with Jade Mountain. We can’t wait to return!! Food is the best ever and I have travel all over. The music is excellent. Our honeymoon could not have been any more perfect. From the second we arrived at the airport we were treated like royalty. Everyone has been so kind and helpful and there as soon as we need them. We felt comfortable and well taken care of. It was so nice to not have to worry about a thing while staying here. Our vacation at Anse Chastanet and Jade Mountain was incredible. It was the best Caribbean getaway ever. All your staff members were ready to make our experience special at all times. Any request we had was considered an attempt to fulfill. We value excellent food, service, activities and tours. Tours were good value. We loved lounging on the beach under umbrellas, reading, eating and swimming. We were extremely impressed with Jade Mountain’s architecture and amenities. The hotel is splendid and the people are very hospitable. We enjoyed our stay and look forward to coming back as well as sharing our experience with our friends. It was a great experience again! Thank you. We really enjoyed our visit to Jade Mountain. Relaxing, quiet and tranquil. Jade Mountain is the closest thing to Shangri La on the planet. It is more than a beautiful, elegant and inspiring place. It is a true sanctuary and place to nurture your soul and dreams, we have found a home for a lifetime. Everything was wonderful. This is truly a beautiful resort and we found the service to be exceptional. All of the staff are very nice and friendly. The room was unparalleled. The pool size, tile-work and view were magnificent. The stars were heavenly. There is nothing needed to improve these rooms. The steel drum playing Sunday night was so fantastic. Jade Mountain is an outstanding resort!! Staff and food is excellent. Everything from our room to the food and the service went beyond our expectations. Jade Mountain is truly the most exceptional place my family has ever stayed at, and we thank all of you for providing us with such a wonderful stay. We have had a fantastic stay. Our sanctuary was out of this world. We hardly left it. All staff were friendly, helpful and offered excellent service. The food in Jade Club was exceptional and the entertainment was a great start to our holiday. We will be back next year! Truly an amazing place, love the open air! Wonderful staff and food service. Jade Mountain is fabulous, incredibly private, has beautiful woodwork, tiles, décor, stunning views, great diving, activities and the most wonderful staff. Our major domo is incomparable with his hospitality, personality and attention to detail. He made us feel special and incredibly welcomed at both of our first Jade Mountain visits. Jade Mountain is an incredible experience, staff and management are very helpful and accommodating. Will come back. Jade Mountain is incredible! Best place we’ve ever stayed! This has truly been the vacation of a lifetime. Every single member I encountered treated me with the most exceptional service I have ever experienced by a collective group of individuals. The Jade Club staff and bar is impressive, especially the chef in the kitchen. All the food was exceptional. We loved the rooms and open wall views. Also great vegetarian menu options. Amazing experience! No complaints whatsoever. Thank you for looking after us so well. We don’t want to leave! We will be back for sure it was a great way to celebrate our 10th Wedding Anniversary. Thank you very much. We had a great time. Beautiful place and well managed. We had an excellent and unforgettable experience in your hotel. Love this resort. Everyone is so friendly. We really felt welcomed as people would address us by our name when they saw us. Absolutely best vacation ever!! Just what we needed. Thank you! We had an amazing stay and hope to return one day! Beautiful resort, great service, great food and great drinks! Would highly recommend. You made our honeymoon truly memorable. Thank you! We loved our stay and the entire staff were friendly and accommodating. Thanks for creating such a special spot in the Caribbean with Anse Chastanet and Jade Mountain! We did indeed have a safe and comfortable trip back but we do already miss your lovely resort and look forward to coming back as soon as we can. My wife and I first learned of your resort in 2001, when we were working as crew on a charter boat in the Caribbean. We noticed in a cruising guide that there was a place that you could rent mountain bikes and ride in a jungle that’s connected to the beach. We thought this was the coolest thing ever but unfortunately our schedule did not allow us to stop in St. Lucia that year. Fast forward to 2012, we were looking for a place to take a vacation and recalled the jungle-biking resort that we had read about those many years ago. We booked our trip to Anse Chastanet and our expectations were exceeded every possible way during our stay. Thus our connection with Anse Chastanet and Jade Mountain began. This is our third trip our little slice of paradise…and we are looking forward to our fourth! Great place and can’t wait to come back!! We could not have asked for a better place to celebrate our honeymoon. From the views, service, food and overall experience, everything was exceptional! All of our major domos were incredible. Will without a doubt be returning in the future. Everyone here is so nice. I loved my stay and will 100% return. It was a very pleasant experience, both the sanctuary as well as outside. Everything was well maintained and overall, we had a great time. Excellent stay, Jade Mountain is an amazing resort. We are repeat guests and will come again. The resort is truly amazing! Love the design and feel. Will return with my boyfriend. Service is 5 star with great attention to detail. Everything was fantastic. Our major domos were great and they stayed on top of everything to make sure we were all taken care of. All of the dive shop staff were fantastic, remembering our names and greeting us every time like we were old friends. Amazing stay at Jade Mountain. Our third visit was as amazing as before! The resort is beautiful, but for me it is the wonderful people! The three major domos who took care of us were individually excellent and as well as a team. No request was too small, no cancel a burden! We genuinely felt everyone wanted to ensure our satisfaction. I had special need in walking and shuttle service was always there. We love JD1!! Amazing room! JE3 is a great room, the pool needs to be heated more in JA4 the pool was nice and warm. Loved being able to paddle board! We loved the farm! Didn’t get there this time but do love that you have it! Really appreciate all of your staff and talented team! They all made our stay so enjoyable. Every person we dealt with were excellent! We have been to many of the best and highest-rated resorts of all sizes on earth, and Jade Mountain is near the top of the heap, just like its natural setting. What is so special about Jade Mountain is not the best food, or best location, or best service, but can be summed up in one word: Unforgettable Experience. We were overwhelmed by the beauty of the property as well as the graciousness of the management and staff. Every detail of the resort is perfection. Could not have had a better stay. Incredible surroundings only topped by outstanding service. Butler service can be quite addicting! Great butler team. Food choices are diverse and fabulous. The entire experience was magical and we are already planning our return. Excellent fitness center which we used every morning. We had a fantastic, unreal stay at Jade Mountain sanctuary, JA3. The surroundings, activities and attention to detail are clearly the best St. Lucia had to offer. The staff here are truly wonderful, a great team! Fantastic food, drinks, service and just the right amount of privacy. We can’t wait to return. We loved our stay, you have all made it very special especially our major domos. I think this hotel must be the most beautiful hotel in the world. Truly phenomenal service, great food, spectacular location and pool was amazing. I truly love this place and we didn’t even get a chance to do activities because we were extremely exhausted. We will return. This place is phenomenal. Most amazing resort we have ever been. So blessed to have the great pleasure to experience with staff that is second to none who make you feel like family. Top notch and unbelievable. Absolute perfection. We have never been so pampered and spoiled in any of our world travels. Genuine friendliness and care. It came from their hearts and souls. Excellent food. Last but not least their sanctuaries are just that. Every little detail was thought of. The design was that of a true visionary. As amazing as Jade Mountain is, we were more blown away by the service than anything else. Just incredibly nice and gracious people. Our major domos were incredible and we can’t thank them enough for making our honeymoon so special! The food was amazing as well! Some of the best we’ve ever had. We hope to come back to celebrate our anniversary one day! Don’t think we will ever stay somewhere nicer. The facilities and food exceeded our expectations. All the staff were wonderful. And the scenic views make everything seem unreal. We are beyond satisfied with everything. The entire staff was so welcoming and genuine at all Jade Mountain facilities. I am so incredibly thankful for how accommodating everyone was to my peanut allergy. It was so nice to be able to eat desserts and try new foods without the normal restrictions I have most places. The resort is exactly what I imagined a honeymoon destination should be and it is amazing that some place this beautiful exists for others to visit. Thank you all so much for making our dreams come alive. Holy cow, everything was incredible. This was the best vacation we have ever been one in our lives. Literally, the staff was incredible. Everyone was so friendly and awesome. Our major domos were on step ahead of us on all of our needs. Best vacation we’ve ever been on. We wouldn’t change a thing – INCREDIBLE!! Thank you for the upgrade!! Entire experience was superb! All staff were happy and extremely helpful which made the stay so enjoyable. The room was amazing as we had expected from the pictures but the service and people are what made the stay unforgettable! Thank you for making our wedding elopement better than we could have imagined. We were constantly impressed by the beauty of your resort and every single employee we came across. We would love to be back for our anniversary. The service was exceptional. Overall we had a wonderful stay. Everybody was helpful and extremely friendly but our major domo went above and beyond. As our primary major domo he was always responsive and took care of all of our requests. We can’t say enough good things about him. In terms of the sanctuaries, they are gorgeous. Wonderful experience! We had an exceptional honeymoon that we will remember for a lifetime! We enjoyed the service, the resort, the food beach, activities, and so on. We made memories here that we will cherish forever! We are looking forward to our next visit to St. Lucia and Jade Mountain! Thank you for everything!! We will most definitely be back in the near future. Absolutely amazing! Thank you for everything. We will be back to Jade Mountain. We loved every minute! Such as special island/place and people! JD3 had incredible views of the Pitons. Everyone at Jade is so helpful and friendly. Loved the pool in the room (perfect temperature). Moon Sanctuary is beautiful. Views are incredible. The Food at Jade Mountain Club is outstanding. Such a relaxing vacation and great way to celebrate our 20th anniversary. This was a return visit for us and it was an extremely relaxing vacation. It is a beautiful resort with a very relaxed atmosphere. The food is outstanding and each staff member is very efficient and courteous. What an amazing, relaxing and wonderful place Jade Mountain is! We thoroughly enjoyed every single minute here. Everyone on the staff was superb, they made me want to move in and never leave. Loved the Jazz cruise, entertainment was superb! The staff was excellent! This is by far the best hotel we have ever stayed at. We travel often and have been blown away by the facilities and service. Your attention to detail is unmatched. We had an amazing experience in St. Lucia. Thank you so much for an amazing time! Jade Mountain is absolutely amazing. Will highly recommend to others. We had a perfect time, above that you could ever imagine. Also housekeeping was excellent! Thank you so much!! Truly incredible hotel with exceptional service all around! Everything was exceptional!! Thank you for a phenomenal honeymoon! This was our long anticipated honeymoon and everything was spectacular. We have never experienced anything like this from the views to the exceptional sanctuary and the service. Our major domos were fantastic and made us fell so special each moment. Excellent experience. Would highly recommend. Best resort we have ever visited. The food was amazing and service was excellent. This was the best vacation for us ever! The resort views. Services are first class in every aspect. The sanctuaries are all beautiful and perfectly appointed. We especially enjoyed the food in every restaurant as well as the in room dining. Our major domos were excellent, I can’t say enough good things about them we truly appreciate their service and the kind service from each and every employee. They really are the best in the world. Thank you again to everyone for providing the most special way to celebrate our anniversary and each other. We can’t wait to return to our favorite sanctuary! We truly enjoyed every second of our stay! Spectacular service by every staff member. Will absolutely return! Looking forward to making annual visits to the resort. All was excellent, the service by all top notch, the major domos were fantastic and beach staff was excellent. The food was amazing at the Jade Mountain Club. The hotel should be in the leading hotels of the world. Wonderful stay. Far exceeded our expectations! Truly a dream come true! Thank you! Really appreciated the extra mile the domos and kitchen staff took to accommodate my given tolerance. We will definitely be back. We just finished our honeymoon at Jade Mountain. It was the perfect trip and experience. Everything from top to bottom, service to the sanctuary was absolutely perfect. We can only hope to be able to come back in the future to enjoy this wonderful place again. Our major domo during our stay was absolutely amazing. We also did the walking tour of Soufriere which was also very informative and fun due to the guide. Everything was wonderful and service exceeded my expectations. The Jade Mountain team work is unique. Thanks for making our vacation a memory forever. It was heaven on earth. Breathtaking. Service was amazing. All round major domo service was excellent. What a beautiful place to spend our weeks’ vacation! We did not expect to fall in love with Jade Mountain or all the people we met there! All the staff were truly gracious and hospitable. We were spoiled. The food was beyond delicious! We loved the turn down service especially the bed decorations and we also looked forward each day to our snack in the refrigerator. Outstanding service, and architecture. Our major domos were also outstanding. It was a great stay everybody was helpful and friendly. We will come back. We have never been to a hotel with major domos we really enjoyed it. Everything was wonderful. Hope to return soon. Exceeded our expectations. The airport reception was perfect! The hotel reception was very warm and thorough and the facilities are amazing! We are seasoned travelers, we are putting this on our top 5! We had an amazing time! Our view was spectacular! Once in a lifetime experience, but we can do it again! We will tell who might do a trip like this how amazing it is. Before arriving, we had requested JE2. When we arrived, the service began and was exceptional. The view from the room is breathtaking from breakfast to a night cap, everything in between was awesome. Great location, great people and great service. We can’t thank you enough for making this a romantic and enjoyable honeymoon. Looking forward to come back for our anniversary. All the staff were wonderful and well trained. The level of service here is extraordinary as is the beauty of the sanctuaries its surroundings. Your chocolate is amazing. The resort and views are beautiful and the service was spectacular. This is our second time here and the sanctuaries, the view and Jade Mountain in general never gets old. Great service! ThankS a lot! All the staff was very helpful! We’ve travelled many places Paris, Spain, Italy, Portugal, Dubai, Maldvies, Egypt etc… just to name a few. Your staff is #1 and facilities #2 have surpassed by far, the experiences we have had. The experience was amazing, along with the warm and professional help from staff. Many thanks to the friendly staff who were soo helpful and hospitable. We loved every moment! spent at Jade Mountain! Unbelievable, beautiful, Amazing, unforgettable and perfect. We have already started talking about returning for our anniversary. Great experience will recommend to friends. We had a wonderful time on our honeymoon even on rainy days. We were able to enjoy ourselves. Perfect getaway for us. We enjoyed our time and the staff was perfect. Thank you very much. The service was excellent! Made our stay even more enjoyable. Our major domos were great. Everytime we needed anything, they were there and made sure we had it. They were so friendly and welcoming. The people who clean and fix the rooms did a wonderful job keeping the sanctuary peaceful and inviting. Our boat and dive crew made this a once in a lifetime dive experience. They really took great care of us. I travel a lot but Jade Mountain and Anse Chastanet and Scuba St. Lucia, are my favorites. This is my 6th very happy, wonderful stay, will be back. Nothing compares to the excellence of Jade Mountain and the Scuba St. Lucia Dive Shop. Thank you! We had the most amazing experience staying here for our honeymoon! Every member of the staff treated us like royalty and the level of service is truly incomparable. Thank you for an unforgettable trip! Also our room and the views and the architecture are all mind-blowing! We love it here and hope to return for our anniversary trip in the future. After a week we still can’t get enough of the breathtaking views. The service is unmatched to anything we have experienced. Every single thing we ate or drank was amazing. We don’t want to leave! We hope to return and do it all over again. Thank you for this place!!! Jade Mountain was friendly and efficient. Honestly, everyone we encountered from housekeeping to beach staff, maintenance, food & beverage and gift shop, was delightful. Our Major Domos were amazing. You can tell the staff really car, that makes such a unique experience. Quality service! Every single member of staff from the major domos to wait staff to housekeeping were friendly and professional. Very impressive! What a magical way to celebrate our 25th Anniversary, thank you! From start to finish everyone we had contact with was outstanding! All three of our major domos couldn’t do enough for us. They made sure our anniversary on September 24th was a perfect day. From the beach dinner arrangements, massage booking to the lovely chocolates waiting at the end of the evening. They made the day amazing! All the staff at Jade Club were pleasant and very efficient. The staff was extremely efficient, polite and friendly! What a lovely resort! We cannot wait to come back!! Our room was beautiful and the views was heaven. We really loved our stay and will be back again. Very memorable, will never forget the view! I have recommended this resort to family and friends on my facebook. Thank you all for such a memorable honeymoon. Everyone is so kind and helpful. This has been an amazing experience and we hope to come back over many years. Our favourite restaurant was the Jade Mountain Club. The food and service was noticeably better than other restaurants. Wonderful service, loved our major domos they were all very sweet and helpful. It was a wonderful experience. Truly one of a kind, we will not forget it. Thank you to entire staff for making it memorable. We had a wonderful honeymoon at Jade Mountain. The staff was extremely welcoming and helpful. The facilities were all very clean and the views from our sanctuary were incredible! We loved how personalized everything was, how the staff members knew us by name and went above and beyond to make our stay so special! We loved Jade Mountain and plan to come back! Awesome experience! We don’t want to leave! Perfect service since we arrived, service everywhere was very friendly. Our three major domos were amazing. We are dreaming of our next vacation, our surprise vow renewal was incredibly memorable. Every person on the grounds greeted us so nice. The major domos were absolutely top notch. Each major domo connected with us on a personal level and it seemed as though they genuinely enjoyed what they did. Beautiful property. The rooms are stunning. The major domos were great. We had the most magical few days at Jade Mountain. The food was some of the best we ever had. Top class the view from our sanctuary took our breath away every day. Jade Mountain will hold a special place in our hearts forever (we got engaged on our last night). We’ve been travelling throughout almost all the Caribbean Islands. Jade Mountain has one of the best customer service!!! Thank you very much, we have no complains. Loved, loved, and loved it!!! We also wanted to mention that the food was AMAZING!!! Thanks to our wonderful major domos who surprised us with a lovely bath when we came back from dinner. Not only were we amazed by the natural beauty but also the complex design of the architecture that integrated so well and added to the beauty of the surroundings. We would state that Jade Mountain is one of the few places where the experience of being there exceed the beauty of any pictures or videos. However, as great as the location is, the staff of Jade Mountain is what made our stay really enjoyable. Almost everyone we met seemed genuinely happy to meet us and interested in our comfort and that we enjoy our time. That is outstanding hospitality. The treatments at the spa were excellent and staff were very well trained and knowledgeable. We had a wonderful time. You have a beautiful resort with excellent service all the way around. We will definitely be back! Excellent atmosphere, surroundings, ambiance, cuisine and service. An unforgettable experience! The major domo service was great. We will absolutely come back again. I can’t say enough good things about our trip and this place. There is no question that we will be back, and I will be leaving a detailed 5-star review upon return to the U.S. Thanks to everyone for making our honeymoon the genuine trip of a lifetime! Staff – It’s most pertinent to begin this review with the people of St. Lucia, because they are responsible for all that follows. We were highly impressed with the friendliness and kindness shown to us by almost everyone we met while in St. Lucia. The staff has impeccable care, consideration, and attentiveness to one’s every need and desire while visiting. The beauty of this is that, while professionally trained, it all starts with an innate hospitality that is customary to all St. Lucians. We felt a genuine sense of care and kindness that came, not only from the direct staff of the resorts, but the tour guides, water taxis, shop sellers, etc. everywhere that we went. We felt comfortable, always safe, and as though we were welcomed guest amongst a small town community. It’s critical to mention that there was always staff available at any moment prepared to provide any reasonable request one could have. Not only that, but we often noticed that they would go above and beyond by anticipating needs before we even had them! It felt as though we were VIP guests the entire time we were there. The Food - We literally did not have a bad meal over the course of 7 days! We tried as much as we possibly could, both local and well-known comfort foods from home. The chef and wait-staff are phenomenal in their preparation and presentation of dishes. Living on the coast ourselves, my wife and I are both very familiar with seafood and tropical fruits. We tried many fish and fruits that we normally dislike back home, but were some of our favorite meals while on the island! The chefs have the gift of making any and every food palatable and tasteful, regardless of its natural degree of harshness. We also NEVER found ourselves hungry or wanting more. I can’t recommend an all-inclusive meal-plan enough, as it provides freedom from the worry of expense and a plethora of options 24/7 for one to try. It is extremely easy to go over a week and have a different meal every single time you eat with the amount of options offered. They offer not only local favorites, but an entire line-up of authentic Indian cuisine, French, Italian, American favorites, etc. There is something for everyone! It should be mentioned that almost everything is grown or harvested right from the resort’s own plantation and is apparent in its freshness. The Atmosphere – This is paradise on Earth, there is no other way to describe it. You have what I would consider one of the best two beaches on the island because they feel very exclusive. While anyone can come and enjoy them, because Anse Chastanet and Jade Mountain offer a very limited number of rooms compared to many resorts, there is more than enough room for everyone and you don’t feel like your cramped in a tourist trap. We never had a time where a beach hut wasn’t available for us directly at the water’s edge. The resort’s second beach, Anse Mamin, rarely has more than a handful of people at it, and literally has the possibility of being your own private beach, if not certainly feeling like it. Having coral reefs all around with direct and easy access for your pleasure is icing on the cake. The views, particularly from Jade Mountain, are arguably the most beautiful anywhere in the world. I took over 100 pictures of the Pitons from our room over the course of the week, as I simply could not get over their beauty and closeness. The skies and waters are turquoise and deep blues, while you’re further surrounded by lush green rainforests, colored flowers, and the resort’s very own plantation. I should also take time to mention the attention to detail in the design and architecture of both locales. Everything is tastefully organic, and clear effort was made to make the resorts part of the surrounding environment, rather than stick out like a sore thumb. You feel as though you’re amongst nature at all times, rather than viewing through the looking glass. The birds are constantly singing and the sounds of water flowing everywhere will lull you into an unending trance while you stay. It would be a sin to not highlight Jade Mountain’s magnificence as well. The genius and attention to detail in its design is unlike anything else I’ve seen in my life to this day. Nick Troubetzkoy’s preparation, attention to detail, and overall theme of openness with nature is unmatched by anything I’ve experienced. 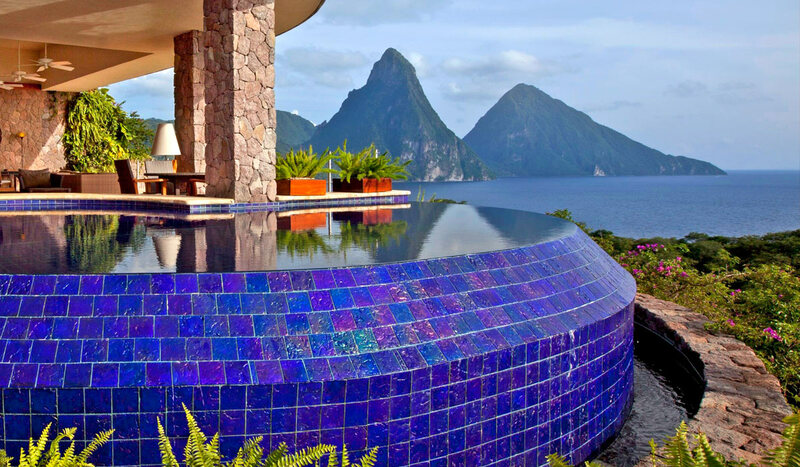 The views of the Pitons from your own private infinity pool cannot be beaten by anywhere in the world. The color schemes, woods and stone, ponds, and asymmetric design of Jade Mountain are reminiscent of heaven itself. Things to Do – The excursions offered are fantastic and offer plenty to do for everyone. There are flight tours, jazz accompanied sunset sailing, jungle biking, fishing, scuba diving, hiking, tours of the volcano, mineral baths, botanical gardens, waterfalls, chocolate plantation etc., not to mention complimentary snorkeling, kayaking, paddle boarding, mini-sailing, and more. The best part is, several of the resort’s package options include vouchers for many of these things, to help you in planning and experiencing some of their favorites. We did a little every day and could easily do completely new things upon a return visit. The overall quality of this place is hard to express. It is a definitive 10/10 in every element and it is clear that the Troubetzkoy’s and Staff have gone out of their way to make sure that, that quality is apparent in every aspect of your stay. There is a 100% assurance that we will return, likely sooner than later, due to the fullness of our experience. We can’t thank the team of Anse Chastanet and Jade Mountain enough for their hospitality, quality of care, and willingness to share their piece of paradise with us! Great place! Superior Hotel! The view is breath taking. Staff is very friendly and the sanctuary is very relaxing. All the staff are amazing!! Thank you for making our honeymoon so special the rooms are breathtaking. The staff is amazing and attentive. The best food ever. We would love to visit back. Thank you so much. Service was exceptional! Food was world class and staff was spectacular. Amazing overall. Loved it and will be booking our next trip back before we leave. An incredible experience from the moment we arrived to the moment we checked out. The room, the food, the service were all second to none. You have made my husband’s 50th birthday one he will cherish always. This place is truly heaven on earth. Thank you for making our stay so very incredible. Our stay at Jade Mountain has been incredible. We are very thankful and impressed with all of the kind and helpful staff. We will never forget our time in St. Lucia and are very hopeful to return soon. Excellent! The Treehouse food was wonderful. Really enjoyed the tour of the farm also. Everyone here offered top notch service. Great staff! Major Domos were great! Diving is awesome! Dive shop staff is great! It was our 25th anniversary trip for my wife and I. We just wanted to relax and we did. Perfect Lionfish and baby turtles were a highlight. Jade Mountain Resort is beautiful and the staff went above and beyond. The staff at Jade was very attentive and we had a great time. We also were very appreciative of the room upgrade we received. Our only complaint is the room temperature. It got very hot and buggy. With being in the sun all day, we felt that we had no place to get relief from the heat. This is our third visit to Jade Mountain, the service, food and accommodations are excellent. We’ve stayed in many hotels around the world and this resort ranks at the top of our list. Hopefully, we will return soon. We loved every second of our stay and are already discussing the timing of our third stay at Jade Mountain. We were amazed at how friendly all staff members were. They always had a smile and a wave and went above and beyond. Staff at the restaurant were exceptional, especially the assistant manager. Housekeeping was also awesome!! Our domos were hands down THE BEST EVER! We had the most amazing honeymoon thanks to the wonderful staff at Jade Mountain and beautiful views! The room was amazing. This was a vacation we’ll never forget! Again a huge thank you to the staff who we loved!! The most beautiful place with the very best staff and service! Jade is absolutely breathtaking and amazing. The major domos are amazing. The sanctuaries are amazing you never want to leave. Absolute best Swedish massage I’ve ever received!! Great customer service by all Jade Mountain staff! Excellent food for an all-inclusive resort! Housekeeping made the room nice for us on our last night! This resort is magical, incredible views and outstanding staff made for a wonderful vacation experience. The most breathtaking and perfect honeymoon stay in Jade Mountain. It exceeded far beyond what we had imagined it would be. We were upgraded to a moon sanctuary which was an incredibly kind gesture and were so grateful for that. We could not speak for a long time when we were shown the room by our major domos, the room was truly breathtaking. The architecture is phenomenal. I would also like to thank all your staff in both Jade Mountain and Anse Chastanet. The level of service/work ethic and genuine hospitality I have never seen before, from our welcome and professionalism shown by the Manager to the service and kindness of our major domos and the Caribbean spirit of the bartenders at the beach bar. That is to name a few, but ALL staff and St. Lucians we met were truly lovely. It was our first trip to St. Lucia and indeed the Caribbean and although it was our honeymoon and a cause for such a luxurious celebration, we hope someday to visit again. So thank you again for the holiday of a lifetime. Wonderful resort! Fascinating and most impressive to read about Nick and his journey to build Jade. The waterscapes article in the room was brilliant and a great read! Our major domos were excellent! Emerald Garden/Farm was most impressive! and the culinary team is exceptional. We had three spa treatments that were exceptional as was the space. We had an excellent honeymoon at Jade Mountain. Our Major Domos were amazing and the facility is beautiful. All of the excursions were excellent! All the major domos were excellent. The attention to detail they presented was amazing. The food couldn’t have been better. I do not think I will ever be completely satisfied with all meals like I was here. There wasn’t a meal I didn’t fully enjoy. A+++ to the chefs. Truly a 5 star resort. Many are ranked 5 star but this is truly a 5 star. Both our Major Domos were awesome. All the staff at Anse Chastanet and Jade Mountain were super friendly and personable. We are so glad we chose St. Lucia for our honeymoon. Every single person we encountered at Jade was absolutely wonderful and made us feel at home! Best week. Every meal was accommodated to be made gluten free and that made it seem effortless, which was incredible and exceeded expectations. The best trip we’ve ever taken. I especially loved waking up and just lying in bed looking at the view and listening to the birds and I’m not usually the type to lounge in bed. Sanctuary is the perfect name we were truly able to relax and unwind. The staff here has made our trip very enjoyable. Everything was outstanding! Our honeymoon was even better than we could have imagined! We are so happy with our say at Jade Mountain! Breathtaking views, incredible food and service. We loved every moment! The sanctuary was pure bliss! We loved the pool and the afternoon tea in our room. We will be recommending this place to all our friends and family. Thank you! Everyone that we have interacted with at Jade Mountain has been exceptional, friendly, genuine and very helpful. This is truly a 5-star resort. The owners have taken into consideration every possible need. Aside from the sanctuaries, what stood out, was the personal greeting from every staff member. I had a sense that they knew exactly who I was or at least which room and my needs. My overall stay was exceptional. This resort has far exceeded our expectations. From the food to quality of service we could not have been more pleased. We will be coming back in the future, no doubt we will be recommending Jade Mountain and Anse Chastanet to all of our friends and family. We want to return for our 5 year anniversary, this was our honeymoon. Very different. We did enjoy ourselves. The bar crew was very entertaining and friendly. The major domos did an outstanding job. The island is very beautiful and the rooms are romantic. Coming to Jade Mountain was a spot of the moment decision during our honeymoon resort search. We decided it would be best to come here at the end of our honeymoon after reading glowing reviews online. Our stay was nothing short of amazing and we hope to someday come back in the future. Overall, it was great. Staff and facility as a whole were great! It was an excellent week. Everything was lovely. One of the most beautiful place I’ve ever seen, and I travel quite often. Thank you for your beautiful memories with my daughter. The perfect serenity of this resort is like no other we have ever visited. We are enamored by the design of the building, the beauty of nature, we were immersed into the quality of the people who complete the experience with impeccable service. Our Major Domos, we appreciate each of their attentiveness, good, fun loving natures and respect for privacy. Their service is unparalleled and made this vacation extra special. Thank you, Jade Mountain! Everything was great except that we were charged for two specialty cocktails at beach bar. The major domo’s were unbelievably amazing. They surpassed all expectations. I don’t have enough compliments to describe how superb they are. The food and service were amazing! We loved all of the restaurants but loved Jade Mountain Club. The entire staff was so awesome. This place is so amazing. Thank you so much!! Our stay here met and exceeded our expectations. Thank you for serving as the perfect venue for our vow renewal. Loved the entire experience. The staff was amazing and very friendly. JE2 is gorgeous! It is magical. An experience that may never be equaled. From the moment of arrival until the moment we departed, we felt as if we were the most important guests on the island. Everyone knows you by name, addresses you by name, and treats you as a friend. It’s not a matter of if we will return. It’s a matter of how quickly we can get back. What a wonderful place! I loved the architecture, the effort into environmental sustainability. Would recommend both Jade Mountain and Anse Chastanet to friends and family. I hope to be back. Jade Mountain was the most amazing place that my wife and I have ever been to, and we’ve been to a lot of nice places. The sun room suite just blew us away. Just amazing. The design, pool, bed, everything was fantastic. Our major domos were the best. They were extremely friendly, attentive, and did everything possible to take care of us and make sure we were happy and having a great time. We’ve never been to a place with that type of personal service, and it was a major part of our great experience. Our specific major domos are huge assets to Jade Mountain and hopefully can be recognized for they outstanding service and experience they provided to us. The service in the restaurants, bars, and beach were outstanding as well. Jade Mountain definitely has the best high quality staff. Absolutely loved it!!! We will return. We had a WONDERFUL trip to Jade Mountain and will get the online comment card filled out this weekend. The room JE2 was PERFECT, the staff was outstanding. Jade Mountain was an exceptional holiday! From the upgrades, service, getting to know the staff especially the major domos. The experience was fascinating! Already planning to return! Jade Mountain sanctuary and Club restaurant are second to none in our experience. The sanctuary views and pool were a dream. Service was excellent. Staff was top notch, services and rooms were over the top! Some of the best service we have ever witnessed. The major domo service is top notch. The food was beyond excellent. Excellent, beautiful, friendly and delicious. Three things we love. Jade Mountain was by far the best all-around resort we’ve ever stayed at. We had high expectations prior to our arrival and those expectations were exceeded on almost every front. It was a truly amazing stay!! We thought this was a once in a lifetime thing for us as we celebrated our 20th wedding anniversary, but now we’re certainly thinking about a return visit someday…Thanks again for all you and your team did to makes our stay so fantastic!! We came to Jade Mountain to celebrate my husband’s retirement and our anniversary. It was perfect, we relaxed and enjoyed all that you had to offer. We loved the food – each meal was exquisite! The service and attention to detail from the major domos was top notch. We enjoyed the tour of the Emerald farm and a spectacular meal prepared by the chef!! I can’t say enough of how wonderful and truly memorable this trip has been. We liked the snack box in the fridge. We like the coconut water on the beach and the abundance of fruit. Also liked the variety of the menu at the Jade Club restaurant. We really enjoyed our honeymoon, the food and service was excellent. Fantastic place! The services and food were great for the most part. The dinner at the club was amazing but the time it took between courses was a little long. Our tour desk operator and major domos were amazing. This is incredible. When arrived we thought the 5 star aspect would be the hotel and the views, little did we know it would be the employees. Truly some of the nicest human beings we have encountered on our travels. From the butlers to the wait staff to the spa employees. Everyone was genuinely concerned about our comfort and experience. Cannot say enough about the cleanliness of this room. Housekeeping went above and beyond daily to do little touches. They have such a huge important and sometimes underappreciated and unseen role and we appreciate them! Our overall experience was excellent. The staff and service were world class. Facilities and amenities were very good. Wherever the inspiration came from Jade Mountain is a masterpiece that reconnects the body, mind and spirit back to the true purpose of life – simplicity and the art of sewing the heart, stopping the clock. My wife and I have never experienced a more peaceful and introspective period of time in our whole lives. This is a precious, magical and serene spot in a very busy world. You have created heaven and will evangelize Jade Mountain to all those we meet and know. Thank you for your gift. This trip has far surpassed any expectations we had. The service was excellent. The Major Domos made our stay amazing. The dinner service at Jade Club was excellent. Everyone was so friendly!! We hope to visit this beautiful island soon! Far exceeded our expectations. All staff was beyond friendly and always willing to go out of their way to make a perfect experience for us. Will recommend to others and will likely plan an anniversary trip back in the future. Everything was phenomenal, food was great, and all the major domos were very helpful and fast with services. This was our 25th anniversary celebration what a beautiful and heavenly resort. We really enjoyed ourselves, the people are the best!! Everyone was always there when we needed. I thank everyone that took so good care of us. Without any doubt we will be back. See you soon! Overall fantastic experience. All the major domos were great. We greatly enjoyed our honeymoon stay at Jade Mountain. What a glorious resort and special place! We will be back! Our Thank you is not big enough a word to represent the sheer thrill and adventure of staying at Jade Mountain on July 23rd. My husband our family have been coming to St. Lucia for 25 years. I have watched Jade Mountain from the water and always longed for an opportunity to be there. A couple of years ago, we toured it – the guide (Jean-Paul or Pierre?) was an engaging, persuasive and entertaining ambassador who made me fall in love with the entire concept – I knew I’d be back. Whilst my husband wasn’t inclined toward the ‘missing wall’…my sisters were happy to say yes and be there with me! We so appreciated the upgrade. I hadn’t realized how intricately involved the infinity pools are to the soul and fabric of your theme and purpose…so, having one and being on a higher floor added a lot. You vision and story have truly manifested into the most amazing experience for those of us having the privilege to be there and witness it. I’ll be back for sure! Our major domo was a perfect, fun and warm match for the three Perry sisters! We so enjoyed her personality and her first-rate service. Other members of your staff who helped us with our reservations process were fabulous as well. Thank you for making our honeymoon the best we could’ve asked for! EVERYONE was wonderful. We will definitely be back in the future! All meals and service exceeded our expectations! Fabulous! Great Chef!! All the staff was super helpful and friendly. We were blown away and will not be our last! Will recommend highly to all family and friends. We have had a wonderful trip here with you all at Jade Mountain, the hospitality and service was amazing and truly made the trip for us. I want to thank all of you here at Jade Mountain for making our honeymoon an unforgettable experience. The views, activities, and hospitality here at Jade Mountain are amazing. All the effort put in really makes for the most relaxing and enjoyable experience, Mrs. Smith and I have ever experienced. This is a special place and all the people here make it an exceptional resort. We look forward to returning in the future and will encourage friends and family to join you all as well. Thank you very much. Overall of course the hotel is exceptional. The visual splendor of it is breathtaking. The view from the terrace is breathtaking. The view from the terrace is wonderful at sunset and I had some delicious martinis to enjoy it with. The food is very good in the restaurant and we had some very tasty meals there. The spa treatments that we received were fantastic. The sanctuaries are staggering in terms of their initial visual impact, and their spaciousness. On our last day we were allowed to use JF6 until our flight which was a BRILLANT thing and we couldn’t be more grateful. We actually loved being there, enjoyed the air conditioning and felt that we would have had quite a different experience if it were our room. Next time I will be sure to request it. The food was outstanding in all venues. The sanctuary was perfect and the hidden beach was great. Most beautiful place! Thank you so much for going above and beyond to accommodate our special needs Best vacation ever. Everyone was lovely to chat with and very willing to assist when asked. I very much enjoyed my stay. Fantastic facilities and staff. My wife and I have agreed that our visit was life changing. Between the natural beauty, the facilities and the service, our outlook on life has changed. So much more appreciative of people, places and relationships. Thank you again for a most memorable experience!!! Jade Mountain continues to be the best resort there is. Thank you for making our stay, so special. It was also nice that a big deal was made about us returning (even though it has been 10 years!) for our anniversary. Thank you! We were here 10 years ago, the place was spectacular then and it is still spectacular now. Very much enjoyed our stay. Have been planning/saving for the trip for almost two years and was exactly what we wanted, if not better! Thanks to everyone who made this such a special trip. Food is excellent in the Jade Mountain Club. Our major domos were excellent. Airport reception lady was very nice. Country & Western night at Treehouse was EXCELLENT. The food and service at Jade Mountain restaurant was excellent. We had an excellent stay. Far exceeded our expectations. All three of our major domos were amazing and helped us with everything we needed. All the staff at the resort including Anse Chastanet were amazing. The staff at Jade Mountain is excellent. We have never received such perfect service. All staff members are kind, smiling and made us feel welcome and at home! Thank you!! We had a fantastic stay! We are fortunate to have been able to stay here for 4 days. Our major domos were incredible and very helpful. We will recommend to all our family and friends. All members of staff were attentive and friendly. Very smiley faces! Both at Jade Mountain and Anse Chastanet. All very helpful and happy to be working at such a wonderful place. Thank you to everyone who contributed to making our holiday/anniversary an extremely happy and memorable one. Amazing sanctuary. Major Domos service in general are excellent! Just beautiful! Very very beautiful! Chose this location for our 1 year anniversary and loved it! I have to say the service and hospitality is the most amazing. I have ever experienced!! I am a YouTube blogger and I’m doing a tour of this resort as our honeymoon trip. We will definitely return! Thank you for a great experience! Loved it! Wonderful stay! Everyone was extremely helpful and fun. Thank you! Everything was excellent. We had a wonderful time. Wonderful service. Really enjoyed the staff. We will be back! All the freshly squeezed juices are so yummy at breakfast. Lunch at the Jade Club and Jungle Burger Bar are AMAZING! Dinner at Jade Club was also AMAZING. All your musicians were incredibly talented. A huge shout out to the housekeeping staff, they made the room a beautiful sanctuary three times a day!! We loved the incense, it smelled so good! The beautiful notes, flowers, and towel creatures. Thank you for all your hard work we appreciate it! Do I need words to express how much we adored the Sanctuary Pool? How do I go back to a normal 4-walled bedroom with no pool? It will be hard to leave. Spectacular sanctuary, both of us thought the food (Jade Mountain Club) was superb. The menus did provide a good selection of very interesting and delicious dishes. Housekeeping did a great job. Everyone was very nice. Special thanks for the beautiful flowers. We had a great experience. We love our room, but we think the upper floor would have a better view of the ocean. Excellent service. This resort and experience is beyond words! Our room the staff, the facilities, the food and all events were “over the top” quite frankly, we don’t know how we could go anywhere else after this. Thank you for providing us the most amazing and memorable escape vacation. We will be back! The hotel is unique and amazing, a slice of paradise for sure. Interestingly the service people are just as amazing. We have travelled all over the world and the service at this resort is at the top of our list. Thank you! We hope to return. It was amazing! We will definitely recommend. Great honeymoon! All of our major domos were great! Saxophone on the jazzy cruise was great. As outstanding as the facilities and setting is here at Jade Mountain, the service is what sets the resort apart from past experiences we have had. All three of our major domos were outstanding. Wonderful trip, exceptional service. Well worth the anticipation. Thank you! Great Overall value! Love the views, property and great beaches and scuba dives. This is our second trip to Jade Mountain and it remains my absolute favorite hotel to visit in the Caribbean. We have raved about the views and quality of service to our friends at home and are considering coming back with two other couples. Truly a unique experience. Your views and architecture make your hotel remarkably unique but it’s the genuine pride and unparalleled service of your staff that makes Jade Mountain exceptional. I never passed a single employee from Major Domo to beach staff who was not wonderfully polite and engaging. Everyone was top notch. Amazing place. Cannot wait to return!! We cannot express how relaxing, comfortable, fun and amazing this week at Jade Mountain was the facilities are absolutely beautiful. The views from the sanctuary are striking. Everything maintained perfectly. From the moment we stepped on the grounds, until the moment we left, we felt like family. The major domos went out of their way to make us feel taken care of. They were so accommodating. We can’t say enough good things about our stay. We cannot wait to return! From the helicopter ride, to the warm welcome at the resort, to the gracious staff…every detail has been amazing. The staff members CAN NOT be friendlier! Every aspect of our stay here has been relaxing and romantic! Jade Mountain has been an unforgettable vacation and we will definitely be planning another stay here soon! All of the staff was so friendly and helpful, we felt so comfortable and relaxed in their hands. We cannot stop raving on how amazing it is here. The most amazing trip, we will be back!! 5 stars! To our Major Domo team they are absolute rock stars. They treated us like royalty the entire time and made us feel like celebrities. Their personal touch on everything they did absolutely made our trip, and we are sad to be leaving. We will certainly be back and I can’t stress enough how special our Major Domo’s made us feel. Also the restaurant was amazing. The manager at the Club treated us like family, and the waiter was the best, 5 stars to them as well. 100% this is the best trip of my life. The helicopter transfer was amazing! It made everything start on such a high note! The food was incredible. From the in room shades to the restaurants – out of this world! Thank you for such a wonderful way to celebrate our first year anniversary! Such a delight! Room like no other!! Loved daily Bento boxes!! Loved the postcards with quotes, swan towel, petals, and chocolates – all so special! Overall service was friendly and prompt in all facility locations. Every food and beverage service was done with care and nice presentation. Staff seem genuinely interested to make the guest experience a great one. All locations kept clean, including beach and housekeeping did an excellent job. We very much appreciate all the efforts by the full team (Major Domos, food service, housekeeping and entertainment) that made our experience unforgettable. The best part of Jade Mountain is not the sanctuaries but rather the service. The major domos provided everything we needed without hesitation. The facilities are nice, and the plunge pools are a good touch. This is maybe the most fabulous place we have ever stayed at. The setting, the service, the food, and the amenities – all were amazing! Keep up the excellent work and we hope to return. We had a wonderful time at Jade Mountain. We loved how the entire resort is part of nature and not commercial. The rooms were incredible and the beaches were so relaxing. We loved the rotating music entertainment at Jade Club (especially Rob and Phyness). We loved the Jazzy boat trip and the other excursions we took. This was one of our best trips and we look forward to returning!! We loved everything about Jade! We hope to return soon! Will recommend to all our friends. This place was amazing and every detail was taken care of. We were here for our 20 year anniversary and everyone made it very special. The rooms are one of a kind and amazing. Our major domos were very attentive. The spa services were excellent. Definitely one of our best experiences at a hotel. We loved this place! The service staff and views were spectacular. The breakfast every day was great. We enjoyed every minute relaxing, calming, joyous vacation experience! Romantic and beautiful. How could you not fall in love with it from the minute you arrive? You feel like you were there in a private experience with the design of the hotel and never felt any sense that the hotel is full. Fantastic! Thank you for a wonderful honeymoon. The staff and facilities were absolutely incredible. The service was second to none. Every staff member made us feel so welcomed and at home. We truly enjoyed our interactions with our 2 favourite major domos. We also had a blast at the bar at the Jade Mountain Club for drinks before and after dinner. Both bartenders were amazing. Thank you again! We stayed at the Galaxy sanctuary JD1. Our major domo was fabulous!! Kudos to your great hotel and staff. Food was delicious. Keep up the great work we will be back soon. Pictures don’t do this place justice – It’s beautiful! But what really makes it truly amazing is the service. The major domo made us feel so pampered and taken care of. From planning our activities and making recommendations. Everything was so easy such as great experience and made for a very relaxing and enjoyable honeymoon! We can’t wait to come back for a future anniversary! Major Domos were wonderful. All staff were lovely. We had an amazing stay here. All the staff at the club, beach and the restaurants were friendly and well informed. The shuttle service was great. The drivers very smooth. The tours were amazing and international. Everything was great! We had the best time! Highly recommend this place to all of our friends. Best vacation yet! Loved the room and location. Excellent care and beautiful people. Loved the Jazzy cruise. Quality entertainment, excellent food and quality presentation. The Major Domos were great and the rooms were outstanding. We had a wonderful trip. This resort is spectacular I will recommend it to all my friends. Our trip was amazing! Thank you for creating such a beautiful resort and committing to keep it excellent! The architecture and integration into the natural environment is awe inspiring! I love the use of local materials and resources as much as possible. It is obvious your employees love to work there as service and hospitality were amazing. Food was amazing! We have already convinced our friends to book a vacation at Jade. They are planning a trip in September! And I know we will be back! Our 20th Anniversary Dinner at the Celestial Terrace was an unforgettable evening. The Major Domos did a beautiful job at decorating our room. That was a lovely surprise to come back to. There really isn’t a bad thing we can say about anyone or anything here. Our whole week was amazing. Staff was exceptional and very friendly. Jade Mountain is such a special gem. From the sanctuary to the people there is just nothing like this place anywhere else. Even though we experienced a lot of rain this stay and we mostly stayed in our sanctuary we thoroughly enjoyed our stay. Our dining experiences were completely over the top at the Jade Mountain Club. The presentation and taste of each meal were simply unforgettable and the attention superb. Our major domos were the very best! We had such an amazing time in December 2017, we couldn’t wait to return. Jade Mountain is heaven on earth. As a New Yorker, who enjoys delicious food at great restaurants too often, I was immediately blown away by this quality of food at every meal, along with the service provided with it. Whether it was breakfast in the room, dinner at the club, or a snack on the beach, it was comparable to a Michelin Star Restaurant in NY every time. I was starting to lose track of how many times I said, “This is the best that I’ve ever had.” I was so excited that I wanted to upgrade to a room with an infinity pool to experience the next level of luxury at Jade Mountain, so I asked about the cost to do so for the last night of our stay. I also thought this would be a lovely surprise for my fiancée. Unbelievable and amazing. The duty manager, went above and beyond and truly made this an experience we would never forget. We look forward to returning for our honeymoon next year. It was an amazing experience. I cannot imagine any other hotel destination providing a better experience. Absolutely breathtaking!! Our Major Domos were wonderful and created a fantastic in room dining experience for us on our second night! Wonderful! This was our first time at Jade Mountain and we couldn’t have had a more enjoyable experience. The service is top notch and everyone is so genuinely friendly. The sanctuaries are unbelievable and unlike anything we have had the pleasure of staying in. Loved every second here. We will be back! The Spa was outstanding. The service was outstanding throughout the resort. Everything was extremely clean. Came for my birthday, very memorable and excellent food. Overall we had the most amazing stay and we will be talking about Anse, Jade, the staff, the food, the management, the sanctuary and the beauty for years to come! What a wonderful place to visit. Every employee we encountered greeted us with a smile and hello. This is what I will remember. We loved the sanctuary. It was the most beautiful room we have ever had. The view was amazing. We had a great stay and the staff was friendly. I loved the spa menu. All the services I received were amazing. Super relaxing. The resort exceeded all expectations! JA6 was a beautiful. The view was the best. We had an amazing time at Jade Mountain! The views from our sanctuary, the beach, the food and the service was incredible. Would refer Jade Mountain to anyone we know. We will definitely be back! Unbelievable experience! The resort, staff and food was amazing!! The Jazzy cruise was fantastic, dining room music was quite good. We had the best time and will return soon. Thank you all for such amazing hospitality. I have to tell you that this is the best vacation we have ever had! The “Sanctuary” is well named. The view, the pool, the food were all spectacular. I must say though, the Jade Mountain staff made this experience amazing. We cannot say enough good things about the major domos and every other staff member we met. They are awesome! Also, my wife raved about her spa treatments! Nicely done. I think my wife will cry when we leave. She is already trying to figure out when we can come back. Everyone was amazing and went above and beyond to make this a wonderful experience. Our stay here at the resort was simply amazing! Everyone that worked here were very friendly and helpful. Both hotels were amazing and we thank everyone for making our honeymoon as special as it could’ve been. Loved our stay. Service was excellent. We have travelled all over the world, and Jade Mountain is top of the line. The food service focuses on excellence. The butler service is unique. Overall the attention to detail with the food service was my favourite experience. We have forward our slice of paradise and will definitely be back soon. Exceptional stay and can’t fault anything. Every single staff member we encountered was lovely, helpful and made us feel welcome. We’ll recommend to all our friends and will hopefully be back! Superb sanctuary and we had the trip of a lifetime. Thank you. We’ve stayed at many beautiful resorts in the Caribbean but this is the most magnificent by far. Never enjoyed our ‘sanctuary’ more. Attention to detail and friendly service are exceptional. Small amenities like bento boxes, fresh towels at beach, fruit and popsicles at beach, eucalyptus mists etc. All add to the experience. Food was possibly best we’ve had at a resort. The staff was amazing. Every employee greeted you with a smile and a good morning or evening. Thank you so much! You helped to make our dreams come true. Everything is first class all the way. We couldn’t be happier. We had a fantastic time. The overall facilities and service was excellent. We definitely recommend to all our friends. Thanks so much for the perfect end to our anniversary trip! I understand why my clients rave about this amazing place! So beyond words amazing. This has been the best two days and our only regret is we didn’t have more time. Everything was just amazing. The major domos were incredible, and all staff were very helpful and accommodating. Everyone went well above and beyond for us. We love this place and will be singing its praises to everyone. We can’t wait to be back! We had the best honeymoon! Thank you for an amazing stay! Thank you very much for having us stay at your lovely resort. It was our honeymoon and we could not have stayed in a lovelier more relaxing location with such attentive and friendly staff. We would love to stay with you again at some point in the future. It’s just a question of saving up the money to do so! Thank you again for your lovely hospitality and hopefully in the not too distant future we’ll be able to stay with you again. Our stay was delightful. The facilities were beautiful and in wonderful condition. The staff were extremely welcoming and efficient. This place was amazing in all respects. Will be back soon. Fabulous week! Very special to tour the farm with Chef Allen and have a cooking demo with Chef Eli. We got certified on this trip for diving. Lots of great underwater sights! Spa was lovely, good treatments. Great tour of volcano and botanical gardens. Yoga was also great and the sunset cruise was a highlight! Guitarist/steel pan player was great. We also had a wonderful beach dinner. The employees here are all some of the friendliest we have ever met. Excellent staff! Magical! One of our top holidays ever. Will be back! What a beautiful, amazing experience. Unbelievable place to celebrate our 25th Wedding Anniversary. We will be back!! The room experience is unlike anything we have ever seen. Amazing property, service and facility. We had a truly magical time, treated better than royalty and respected beyond belief. This will be a memorable vacation in our minds, forever. The peace and warmth we felt cannot be topped. Thank you for having us in your country and your hotel. Jade Mountain is absolutely the most beautiful of the many island destinations that we’ve visited, room service, food are all excellent. Incredible stay – wow! Unbelievable service, food and room setup or amenities. True paradise! The total romance package is excellent. Can’t wait to return. Beautiful! A completely exquisite experience and it was the best! We loved our 5 short days at Jade Mountain – an anniversary to remember. Thank you. OMG!!! What a fabulous sanctuary, which we thoroughly enjoyed. Overall great availability of activities and services, and appreciated being able to put purchases on our room vs carrying around a wallet. Having the phones to access our major domos is an excellent idea. They were very responsive. Food at the Jade Club and at Anse Mamin was fantastic. Overall, customer’s service exceeded our expectations. Everyone was beyond accommodating. Amazing experience! Loved every minute of it. This experience at Jade Mountain was unforgettable. The architect, engineers, craftsmen, tile makers etc. were extraordinary to create this jewel. We stayed in many fabulous hotels, resorts etc. throughout the US and world and Jade Mountain captures our vision of perfection. The integration of water, nature, beauty and sound has enriched the soul. Wonderful experience. The Service and qualities are top notch. Everything here was amazing. We tried various restaurants but nothing beats the Jade Mountain Club which we chose to eat almost every night. We loved the burgers at Anse Mamin Jungle Grill. Can’t think of a better place for a honeymoon. So cool to see various items at the Emerald farm in our meal! Thank you for an unforgettable experience! Having an attentive Major Domo created a unique personal experience that sets this resort apart from others we have gone to. Unbelievable view, service, food, activity and beauty is one of a kind. The total romance package, including drinks, food and excursions made for a relaxing spectacular getaway, we will never forget. The service at Jade Mountain is outstanding! This is a first class experience all the way. The greeting was so well coordinated. The butler service was exceptional. Words cannot express how great the sanctuary is. The daily bento box is a great touch! All of the food we had in the club and in our room was awesome. The chefs do a great job!! The restaurant staff we interacted with were all unbelievably so good at what they do. They made every meal a wonderful experience and it was great to get to know them. Wonderful people! The entertainment was great, yet non-intrusive, this added to our experience. Great job you’re your resort. A++++vacation!! Thank you very much with appreciation. We enjoyed the beauty, sights, St. Lucian culture, and everything else the island and resort has to offer. What makes this place a unique and rare attraction is the staff. We were so pleased with the service provided to us, and we will miss everyone we came in contact with. Our major domo’s were exceptional. The housekeepers were very patient and accommodating. Our bartender was also amazing. This resort exceeded all of our expectations. Staying here is truly a multi-sensory experience that is incomparable with any other destination we have ever stayed at! Thank you for making our 20th Anniversary a truly memorable experience! This was more than a 5 star vacation! The property, service and food were exceptional. enjoyed both rooms and the different views. Dining and evening entertainment was excellent. The staff at all levels and in all locations were consistently welcoming, engaging, friendly and effortlessly courteous. Thank you for an amazing experience, the food, staff, and our sanctuary was amazing. This honeymoon is something we will never forget. Loved our stay, all three Major Domos were amazing and took care of everything for us. Chef Elijah and chef on wheels was the best! He is personable, friendly and very talented! Great job! Thanks for everything!! Service and staff were exceptional! We enjoyed our visit and definitely want to return. Thank you for making my birthday very special! We will see you again soon!! Jade Mountian is an amazing place and we will highly recommend it. We will be back! As with last year, we thoroughly enjoyed our visit. My massage and facial were absolutely wonderful!! We’ve already booked our Galaxy sanctuary for next year!! Overall wonderful place and wonderful experience! Perfect way to spend our honeymoon! Service and friendliness, positivity of staff was excellent. The beach staff was terrific. Our Major Domos were all terrific as well. The Jazzy Sunset Cruise was a blast! Best excursion. We love it and will recommend it to our friends and family. Fantastic massages. We loved our in-sanctuary couple’s massages! All our servers and Major domos were fantastic! The experience was unique and service was a cut beyond our expectations. Major Domo service was exceptional. Overall the staff and sanctuaries are amazing!! Top notch! Amazing!! Thanks for the great stay. We will be back. Our experience and stay were just amazing. We hope that the property is always maintained and kept up to its original beauty. This place is truly one of a kind. We (my wife and I) couldn’t be happier that we chose this for our honeymoon destination. Everything exceeded expectations and we will certainly be back. It won’t be out last!! The most relaxing and wonderful vacation in all our world travels. The staff, food and surroundings were spectacular. Not a bad day we were in paradise. We had the most amazing time ever! Everything and everyone at Jade surpassed our expectations! The finest hotel experience of our lives; period. A wonderful unforgettable adventure! The food and the staff were unsurpassed. Overall we were impressed by the Jade Resort. Particularly with the sanctuary and beautiful view from our pool. The hotel offered a wide range of activities which were excellent and I wish we could have stayed longer to take advantage of more of them. Jade Mountain was fantastic both food, drinks and service. Yoga was just too good. Both teachers focused on mind and body and it was very well connected. I’d come back just for the yoga. Our honeymoon could not have been more perfect! Why would anyone go anywhere else? The total romantic package was totally worth it and every meal was super delicious! We will see you all very soon! Everything was exceptional, our Major Domos were all phenomenal. Exceptional service and attention to detail. Jade Club service was exquisite. It is a beautiful resort and the service is absolutely the highest possible rating. Overall a 5 star right up there with Cheval Blanc and Gili Lankanfushi in the Maldives where we honeymooned. The ultimate castaway dinner was the highlight of the trip. Major Domo were A+++ best I’ve seen! Beautiful, relaxing and peaceful. Staff was excellent!! We never went without what we needed! Everyone was friendly and exceptional service was provided. All the staff we encountered were exceptional! All of them from Major Domo to housekeeping! The finest place on earth. The staff and service was 10 out of 10 stars. All the staff was extremely efficient, willing, courteous, considerate and timely. Compliment to the owners and Management. Wonderful stay, best holiday/vacation experience. All staff from housekeeping up to Management were absolutely amazing! FIRST RATE!! Best resort I’ve ever stayed at. The staff and service are the best of the best from the Major Domos to the beach attendants to Jungle Biking to snorkeling. We did not have the opportunity to yoga be did meet the instructor who was so friendly and knowledgeable. Excellent! We loved it will be back. Spa treatments (Nirvana treatments) and employees were excellent as was our hike and beach yoga. We loved the live music accompanying dinner in the Jade Club every night!! This was a bucket list stay that won’t be getting crossed off the list as we will definitely be returning!! Burgers at Anse Mamin are incredible. Most romantic vacation ever!!! Spectacular! Spectacular resort and exceeded expectations. Happy to get sun on patio in JD3. We had a wonderful and relaxing time in our sanctuary. It was beautiful. We had an excellent laid-back experience that fit our time and space perfectly. No regrets! It was AMAZING experience all around! Every one of you made this trip very special for us! And for that, we are always grateful! The staff are genuinely kind, friendly and care about the guests’ comfort. We have traveled so many places, from Europe to Asia, Australia, but Jade Mountain tops them all! It is a MAGICAL PLACE! We cannot wait to come back! All the staff were absolutely exceptional, they made our trip to Jade Mountain a fabulous experience. This resort is one of the best resorts my husband and I have ever stayed at and we will be back! You have very special staff. In spite of the perfection of the location, architecture, rooms, any place is only as good as its staff. Jade Mountain is the best we have ever encountered. Your team is phenomenal. The Major Domos are absolutely wonderful! Service and food is amazing! Our experience was wonderful. Will come back. Our dinner last night was delicious. The chef made special vegan options for me. Great service from front of house staff. Really appreciated the vegan bento box. Thanks to our major domo for being so attentive! The room and resort were amazing. The staff was great. We definitely plan on coming back soon. Great concept and architecture as real special experience in a commoditized world. Great staff, well trained and truly memorable. We would love to return. It was very pleasant to receive your mail though it should have been no surprise to us – just a continuation of evident professionalism and care. June and I had a wonderful time at Jade Mountain and the standards set by you and your teams will be hard to ever be surpassed. Relaxed, informal but every wish catered for in a fabulous and imaginative environment. What more could anyone ask for? Your support for the environment and community is also admirable and I am sure appreciated by all. 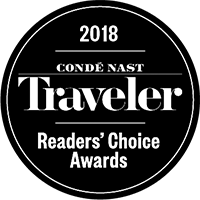 Rest assured that I will review on Trip Advisor and will continue to extol the virtues of Jade Mountain to anyone who will listen. The food was is amazing! We ate so much. Beaches are well kept, everyone who works here is so kind! We felt so at home. Overall the stay was great and memorable. The butler service was fantastic. Excellent room/view spectacular service. Impeccable. Absolutely blown away! We will return. This was a magical experience. Everyone from servers at the restaurant to housekeeping to the major domos, helped make this an amazing experience. This place is beautiful. One of the nicest peaceful places I have ever been in my life. The service, the amenities are “off the charts.” So completely outstanding! Thank you Mr. and Mrs. Troubetzkoy. Jade Mountain was a great resort! Truly an experience we will remember and brag about for years to come. Phenomenal and unparalleled overall experience. Excellent service at all levels. Very quiet and peaceful with great views. The beach service was excellent and all beach staff were attentive. The food was outstanding throughout the hotel. It was amazing! We have loved our stay here. It was a wonderful birthday present for my husband’s 50th! Absolutely fabulous hotel and staff. It’s unique. Thank you! Very lovely place to visit and great service. We had an absolutely amazing experience here. The staff were incredible, will definitely plan on returning maybe for our wedding. Thank you for a time to remember. You have a Jade of a gem. The location is stunning, the villas are breathtaking and the service is exceptional. Service is superior, we came back after an absence of 8 years after spending lots of time in the Grenadines, Nevis, Saba, and Les Saintes. We were surprised to see all these familiar faces, who were so welcoming. Your personnel are outstanding, keep up the good work. We had a wonderful time here at Jade Mountain. It was truly an experience of a lifetime! The staff was amazing. We have been to several resorts in the Caribbean that have butlers, but you have the best. The rooms were better than we could imagine. We will definitely be back and will recommend Jade to all of our friends. Thank you for a great week. Jade Mountain was very comforting and exactly what we look for in true hospitality service. The food was outstanding as well. I had Beef Carpaccio, Seared Duck with a delicious blueberry sauce, and Mahi-Mahi. Compliments to the Chef for a marvelous cohesive menu! We take annual trips to St. Lucia and we will be sure to come during our stay for years to come. We came here because of the reputation of outstanding service, and we were not disappointed. The service is outstanding. Everyone from the restaurant bar, spa, beach and especially the major domos were tremendous. We will be back soon. The Dive shop staff are very professional. They are responsible, hard working men and women who did their best to make sure we were safe and had fun. As usual, the island and resort were beautiful and staff are attentive and friendly. Great! Such a relaxing experience. We were met with friendliness, helpfulness, and we felt very pampered and cared for. The staff certainly aims to please and assist. The food was outstanding and will be memorable. The kitchen staff always made us feel welcome. This was our first trip to Jade Mountain. All aspects of our 10-day stay were excellent. The whole team at Mamin Beach is excellent. We love Apsara restaurant, the food and the team there. The staff and our major domos is helpful and warm. Bravo!! My husband surprised me with this trip for my birthday. I was speechless at the beauty! Never knew such a level of both relaxation and fun existed! We enjoyed world class massages and yoga to relax, and hiked tinker trail almost every day, jungle biked and enjoyed excursions for fun. Jade has it all. The accommodations are breathtaking. When we left, it felt like we were leaving family and friends behind. The connection to the people is a huge reason why Jade is such a special place. Without them, it’s just a beautiful location, they make all the difference. We so appreciate everything they did to make our time there so special. Our vacation meet every expectation!!! The Spa personnel were so amazing and so accommodating. Top notch! We were really happy with the week we spent at your property, your staff was phenomenal. This is our second visit and we truly loved the atmosphere, people, staff and facilities. Fabulous resort and vacation. Thank you! The sanctuaries, food and service were all outstanding. We were especially happy to find that the pools have now been heated – a welcome change to the cold water. Dinner and bar service at Jade Mountain Club was also excellent. We would note that the dinner service staff are very well-trained in proper table service. We very much enjoyed the Emerald Farm tour and would like to go back. Thank you all for a wonderful week we really enjoyed every moment and despite the rainy start it ended with beautiful warm weather. This year’s highlights were as always the staff (especially our 3 domos) all of them were wonderful. Our sanctuary was always wonderful. Thank you for the special welcome flower arrangement in our room on arrival, along with a new beach bag both – a lovely touch. Keep up the great work and hope to see you all next year. A great surprise! Beautiful! Did not expect the service nor the accommodations to be up to the level you provided. Very much enjoyed our visit to Jade Mountain. Our major domos took very good care of us during our stay. We had the most delightful stay, thank you! The staff were exceptional and the food remarkable! “Incredible” describes the resort, the view the staff and overall experience. We will absolutely return. Service all in all was superb, very professional and helpful yet casual. Location, architecture and staff are all top notch and world class. Everything we were hoping it would be! You have assembled an awesome team that represents your facility and the country with pride and skill. Best holiday we’ve had to take and we’ve travelled a fair amount. The design of our suite was spectacular. The bird watching was excellent. Superlative staff throughout and the food at Jade Club was excellent. Jade facilities were excellent, beautiful and staff was terrific. The in-room spa treatment was great and the sulphur mud excursion was also great and our attendant could not have been nicer. The pre-check in concierge service was very helpful. Service at the beach huts was good and breakfast in room and at main restaurant was great. The music at the Jade club was great too. The Jade Mountain staff, every single person was absolutely terrific. The resort is wonderful and we will definitely recommend it to others. The major domos were excellent loved the flowers on the bed on the last night! They were available whenever we needed something. All the staff at breakfast, was pleasant and friendly. They started our days off right. Jade Mountain is our “happy place” and we love returning. We seldom repeat vacation spots but Jade is an exception. Even an overcast say or rainy day is still amazing. We have recommended the resort to many and will return again and again. I knew that the room and the view would be great, but I was blown away by the food and the service. Everything has been fantastic. The property is a great mix of luxury and nature, with a cool vibe. Above all the service from the entire staff is what makes this an exceptional experience for guests. The Anse Mamin Beach is amazing! We will be back. Excellent staff on the beach. The setting is perfect a relaxing retreat and it is made ever more enjoyable by the excellent service and friendly helpful staff. It surpassed our expectations. Absolutely stunning scenery and stylish hotel with excellent staff. Thank you so much everyone!! Can’t wait to come back. Staff was friendly and professional. The sanctuary is unbelievable paradise. This is a wonderful place. The staff is outstanding. Outstanding service, food and facilities. This is our favourite place to be. We go other places in between but Jade Mountain is our favourite. We have been here 4 times. Service was uniformly excellent. We had a wonderful time and hope to be back again. This was a spectacular vacation. We will not be able to top it. Thank you! We had a great stay in our Sanctuary JC4. We loved the view!! Overall the resort is amazing. The service, the setting all fabulous and the spa experience was fantastic. The staff was incredible, everyone was so polite and attentive to our every need. Thanks for an unforgettable experience! We love St. Lucia, Jade Mountain and all our friends there. Loved Jade Mountain. Would definitely recommend dinner at Jade Mountain Club – the dining experience was superb, the presentation and quality of the food were excellent! My wife and I had a really great experience on our honeymoon. What really made this trip for us, was all the staff, especially the butlers. Everyone is very genuine, very friendly and they are all awesome to be around. My wife and I are from another country, and the people all welcomed us warmly. That just helps immensely when travelling to a foreign country and it’s relaxing. The views of the pitons. The Infinity pools in the room is amazing. The food - in particular breakfast and dinner, was of a very high standard. The kitchen deserves real credit for the work that they do. The breakfast choice is great and we loved every breakfast we had. The no 4th wall concept of the room is so unique and what an experience! The snack boxes! We loved these. The Quality Molten Brown toiletries. The healthy menu but still substantial. The Plenty offerings of water. Thank you so very much for your kindness and thoughtfulness. We appreciate all your efforts. We were so impressed with both resorts, food, people, service. We felt very special. Everyone was extremely friendly and very professional. I was sad when we had to leave and I wanted to hug everyone goodbye. You team are fantastic, nothing has been too much trouble for any of them. Very friendly and happy team. Will come back and recommend to friends. Deep Sea Fishing – an amazing skilled crew recommended highly. Sunset cruise and dolphin watching – highly recommended. Loved our chocolate making tour. Remarkable in every way! It’s the perfect getaway. World class accommodations in a magical setting. Best in world class service and excellent cuisine. Was very impressed by the musical entertainment. Perfect for the environment. This was our second visit to Jade Mountain, after 10 years. The service and food continue to be excellent. The major domo service was a nice surprise and our major domos were always prompt and helped us in any way they could. The second beach and additional eating options were wonderful. We had an amazing time on our visit. Every staff member we encountered was extremely pleasant and friendly. I have stayed all over the world in hotels from the St. Regis, to the Ritz, and this was by far my favourite stay. Service was great. Food was excellent. Thank you for making our honeymoon incredibly special. The waiters and sommelier especially make this trip great. Very professional and were awesome. This will be a special place for us forever. Exceeded our expectations. Very thoughtful service. Wonderful experience. We will recommend to everyone without any reservations. Met or exceeded virtually every expectation. The attention to detail in everything was definitely noticed and appreciated. EVERY staff member from the general manager to the housekeepers and grounds crew were at all times kind and friendly. This place is paradise! We are always amazed at how thoughtful the staff are. So impressive! Thank you! We had a wonderful vacation. It was a unique experience! The staff were very friendly and helpful. Food at the restaurant was also excellent. Everyone made us so very welcoming at hotel reception. The sanctuaries is simply amazing! We enjoyed having breakfast in our sanctuary. Dinner at the club was so enjoyable. Returning may become a yearly tradition. We have enjoyed a splendid holiday at both hotels Anse Chastanet and Jade Mountain and this is our Caribbean favorite. All aspects of our stay here have been memorable. We had a wonderful experience. The best quick/short vacation we’ve ever had. We hope to see you again for our 40th Anniversary. Loved JD2!!! Loved the ginger Margarita at the bar near the Jade Mountain restaurant. The sanctuaries and services are impeccable! The combination of sanctuary and view is unmatched in our experience to date. Just breathtaking. We haven’t seen any of the other sanctuaries but, in terms of design, aesthetics and comfort, JD3 was perfect. Will truly miss the infinity pool and its beautiful tiles. We have travelled extensively in the region but first time to St. Lucia. Fabulous resort at Jade Mountain and Anse Chastanet and wonderful island. Great Vietnamese lunch sandwich! Loved the scuba class and farm tour. The massages were excellent! Spectacular! We have been travelling to different islands for 10 years and Jade is undoubtedly the best. Even better than the four seasons Bora Bora. We are so impressed. You have thought of everything. Rooms are perfect, food is amazing and service is phenomenal. Five star all the way!! This place is perfect and it’s the best resort experience we have ever hard! The staff at Jade Mountain was exceptional from the moment we were first greeted we were made to feel at home. Everyone was friendly and eager to assist in any way. Our major domos were very helpful in getting us settled in and scheduled with some amazing excursions. The room itself was so wonderful it will be hard to leave. The grounds and views are breathtaking and unique. Everything seemed seamless. It was all that we envisioned and hoped for. Thank you so much to the lovely ladies in guest services. What a refreshing professional staff always smiling and willing to help. We greatly appreciate all of your efforts to accommodate our travel opportunities! Absolutely loved JB6. We are looking forward to our next stay and sending many friends your way. Many Blessings. This was our first trip to Jade Mountain and we had very high expectations and everything about Jade Mountain exceeded them. This was the best vacation of our lives! We had the best time! Thank you for the wonderful service! Everyone was so nice, accommodating and very friendly! We had a wonderful vacation and wish to come back! You call the suites sanctuaries and they truly are that…a home away from home and an escape from the stress and business of everyday life. My husband and I feel refreshed and rested. Thank you for a wonderful stay. A unique experience most enjoyable. Outstanding, couldn’t ask for more. I would thoroughly recommend to friends. always smiling. Wish we could have spent more time here. The service was outstanding! The Major Domos were excellent. We had an amazing visit at this wonderful resort. The staff is the best. It was an absolutely amazing experience for my wife and myself. Overall, we had a wonderful time here. We will definitely come back!! The spirit here is beautiful, everyone works together. Thank you for double – upgrading us! It really made it special. Food was outstanding, loved the vegetables also the Indian food was a lovely and delicious surprise. Service and food was amazing. Can’t wait to come back and will highly recommend to all of the people that I advise on travel. Thank you! Food was outstanding! Service throughout the stay was perfection. The major domos were beyond helpful and amazing with every request. The room again is gorgeous. Love the attention to environmental issues. We thoroughly enjoyed our visit. The staff here are phenomenal all of them are courteous, friendly and helpful. The major domo for our sanctuary was also outstanding. Our stay here was amazing! I really can’t think of a better place. The customer service was out of this world! J Thank you! Loved it! Beautiful rooms wonderful service. Love the beach with the Jungle Bar. Food was amazing! Thank you! It was the most amazing and relaxing vacation possible! Thank you!!! You have exceeded our expectations. We loved it the first time, and this time even more. We had a wonderful time. Accommodations were excellent and service was beyond excellent. Absolutely had a great time there for the week. The wait staff at Jade Mountain restaurant was incredible. We had a private romantic dinner on the terrace where the Chef and the waiters went way beyond our expectations to meet our needs. Cannot express how awesome this place is. Excellent holiday experience again. All staff were very friendly and efficient. The food was excellent.